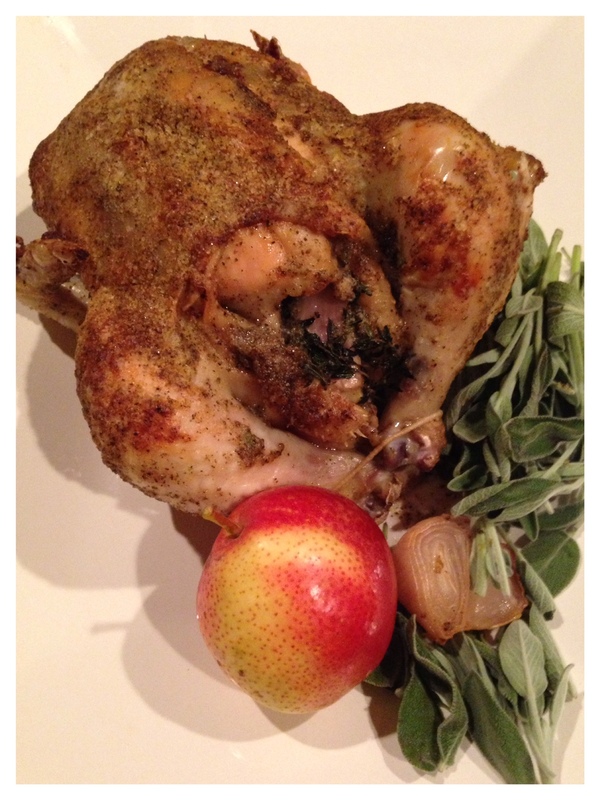 Roasted Chicken with Shallots, Butter, and Thyme | Kitchenpants! I have two daughters, Munch and Bub. (Of course, these are not their real names. These are their nicknames, and the youngest has a series of nicknames as the youngest child often does. They have beautifully classic GQ-approved names that shall not appear here.) The Munch (derived from “The Munchkin”), the eldest, is a vegetarian. Well, except for bacon which is far too delicious to exclude. Bub is a carnivore of the most extreme type. Some time ago, we visited the Fort Worth Stock Show. The Munch gazed into the soulful eyes of prize steer Teddy and declared him “adorable”…while Bub declared him “dinner”. An argument ensued with The Munch pleading Teddy’s case and Bub shrugging her off while insisting that she preferred her “Teddy steak” rare. Clearly, then, it was no surprise that on a weekend trip to the bookstore, Bub made a beeline to the cookbooks and insisted on finding the “meatbooks”. 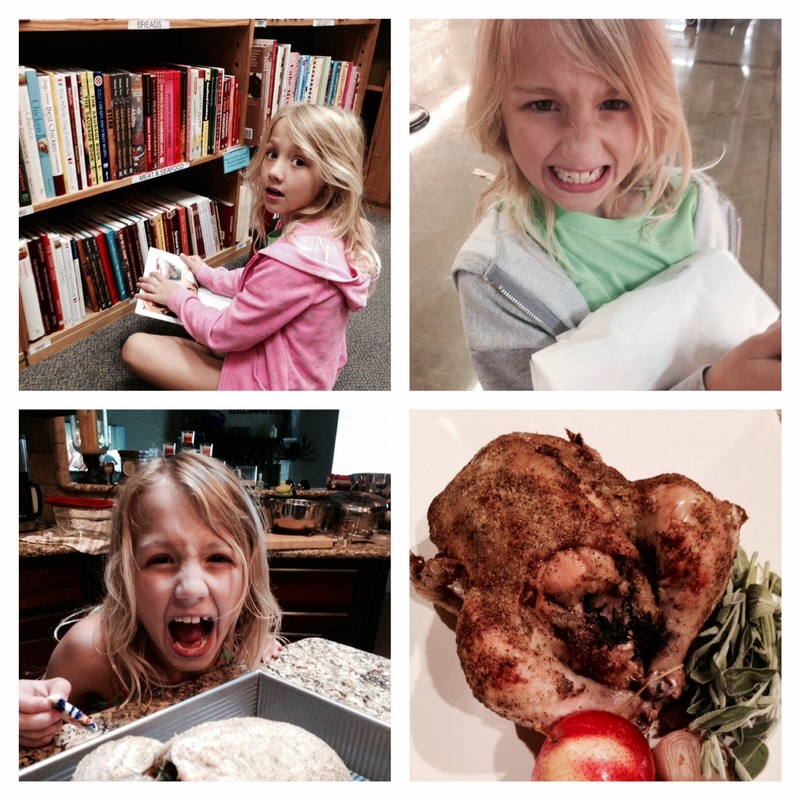 Spotting a recipe for roasted chicken, she squealed: “We have to make this!” And, indeed, we did have to make it – although I, of course, did not follow whatever recipe she found because I’m me and besides, that recipe called for giblet gravy and EWWWWW! In my life, there are very few things that compare to the joy of having my daughters in the kitchen with me. I seize every chance I get. Without delay, I give you our recipe for roasted chicken. This is a fabulous recipe for kids, because it is fun to prepare: gooey and buttery with an elegant result. 1 Whole Chicken – Get a good one. With a simple recipe like this, quality is paramount. Our chicken (“Nigel”) was about 3 and 1/4 lbs. 3 Shallots – Buy them as large as you can. Fresh Thyme – Fresh! You need 15 sprigs or so. 1/2 Cup Butter – Softened slightly. Spice Rub – I love Colorado Spice packets. If you can’t find them at your grocery store, you can order them from Amazon. These are delicious in that they are simple and flavorful and many of them are organic. I used Herb and Garlic Pepper Rub for this recipe. If you would l ike to make your own: combine 1/2 tbs. black pepper, 1/2 tbs. white pepper, 1/2 tbs. kosher salt, 1/2 tbs. garlic powder, 1/2 tbs. onion powder. Easy. Measuring Spoons for Rub – If you make the rub from scratch. Cooking Twine – If you need to truss your chicken. 30 minutes before you wish to start preparing the meal, take the chicken out of the refrigerator and let it come up to room temperature. Place the chicken in the roasting pan on the rack. In a small bowl, mix your butter with your spices. I used a packet of the aforementioned seasoning, but you can season your butter as you wish. Mix thoroughly. Salt and pepper the chicken on the surface and within the cavity. Butter the chicken: With your hands (or your daughter’s hands in my case), spread part of the butter mixture directly on the meat under the skin in the breast area (make a small slit on the edge of the skin and scooch your hand through the breast to separate the skin from the meat) and along the thighs and anywhere else you are going to eat. With the remaining butter, butter the surface of the skin itself. Cut your shallots in quarters and place these in the cavity along with the fresh thyme. Place the chicken in the oven – breast side up – and roast for 15 minutes uncovered. After 15 minutes, reduce the temperature in the oven to 350 degrees. Roast the chicken uncovered for 15 minutes per pound. The chicken is done when the internal temperature reaches 165 degrees and the juice runs clear. Insert a meat thermometer into the thickest part of the thigh to measure. When the chicken is done, remove it from the oven and cover it with foil. Let it rest at least 15 minutes. You can use this very same recipe – increasing the ingredients, of course – for your Thanksgiving turkey. Come Thanksgiving morning this year, Bub and I will be buttering our turkey, Feathers, using this very recipe. Enjoy! Pingback: Cream of Chicken Soup with Risotto and Asiago Cheese | Kitchenpants!